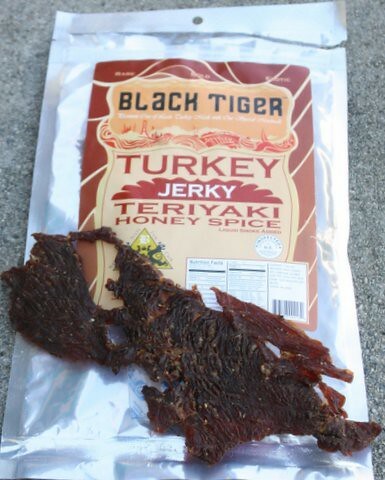 In this review we’ll be talking about some delicious products from Black Tiger Jerky. If you recall, they sponsored our Interbike 2013 coverage. During that time, the kind folks of Black Tiger Jerky sent us a care package so we can test out the jerky and give our thoughts about them. 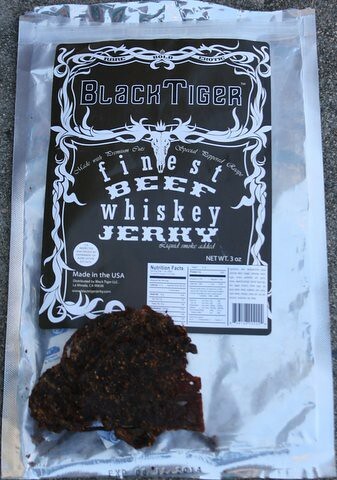 Here’s a spoiler alert, Black Tiger Jerky is pretty darn good! But for the sake of having a review, let’s get started on the review shall we? First up would be The Legend Spicy. Here’s the ingredients: Beef, BBQ sauce, brown sugar, spice, lime juice, liquid smoke, vinegar, celery salt, sea salt. Contains: soy. Beef was easy to tear, you can definitely taste some sweetness at first, then the heat kicks in later. But it’s not an overwhelming heat, just enough to acknowledge that your mouth is hot. Great texture, full of flavor and very easy to chew. The aroma is terrific! The Legend Spicy would actually be paired well with a nice cold beer. Next up is Jungle Spice. Oooh sounds all exotic and stuff. This may actually have been discontinued since I don’t see it on their website. It’s too bad they did because it’s really GOOD! It has a some heat to it but you’re greeted by sweet overtones. Easy to tear and chew. If the Legend Spicy is too hot for you, then you would have liked the Jungle Spice. It’s made up with barbecue sauce, lime juice, sea salt as well as other ingredients that make this jerky flavor one of my favorites. Want a healthier alternative? How about some Turkey Jerky? This one is the Teriyaki Honey Spice. This one actually has 72 calories per 1oz serving, while the beef version has up to 112 calories per serving. One of the ingredients in the Teriyaki Honey is pineapple. That’s actually the first thing I tasted when I bit in to the jerky. The flavor is so unique and pleasant. While most teriyaki flavored jerky has an overwhelming soy sauce flavor, this one doesn’t. It’s really light and tasty! Island BBQ is another one I don’t currently see on their website. Dude, if you like Korean BBQ, then you’ll like this! I swear, it has that same flavor but in jerky form. Nice and sweet with just a hint of heat. Again, it’s easy to tear and chew. Last but certainly not least, Whiskey Jerky. 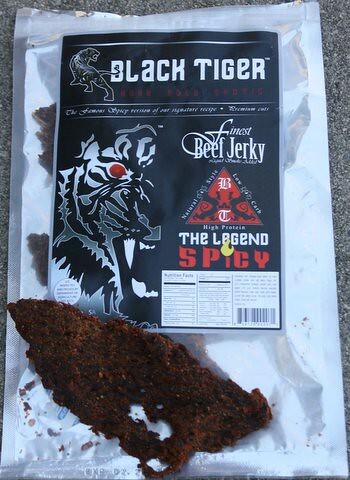 You know, I have to hand it to the guys at Black Tiger Jerky, this flavor is pretty darn yummy of you ask me. Check this out, in their ingredients, it listed ANCHOVIES as one of the items used. Well shoot, if they’re using fish as well as things like Worcestershire sauce and tamarind extract to get this jerky to taste as good as it does, then I would have to give them a high five! Here’s the best part…ready for this? The Whiskey Jerky actually has whiskey in the ingredients! So it’s not just a name, but its actually used in it. So there you have it, 5 different flavors of beef jerky provided to us by Black Tiger Jerky. They even offer Venison, Ahi Tuna and Buffalo Jerky. 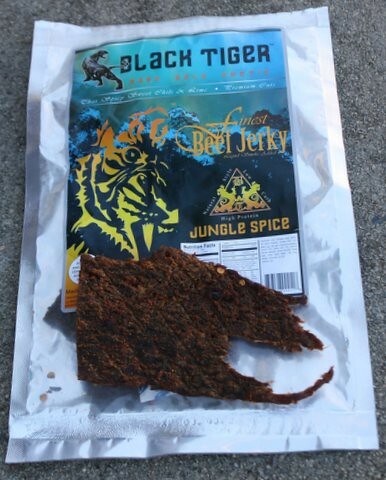 I’m really impressed with the variety that Black Tiger Jerky offers. Not only are they delicious, but the cuts of meats they use are fantastic. There have been times where I’ve purchased jerky and they’re so hard to chew because the pieces have ligaments or connective tissue in them. But you don’t get that with Black Tiger. They took the time to make sure the cuts of meats they are using are premium and offer the best quality in texture, flavor and in the ability to tear pieces off. 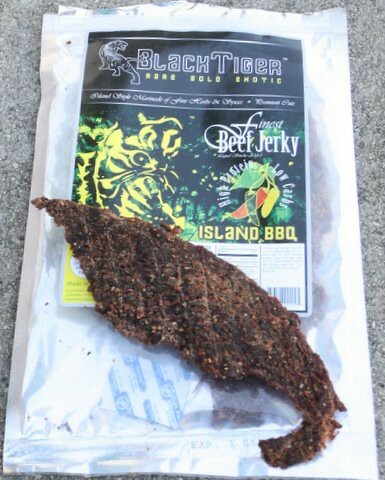 A 3oz bag of Black Tiger Jerky sells for $8. They offer free shipping on all orders. $8 may seem more than what you’d normally pay for at the store for jerky. But one thing they do offer is variety in the types of meats as well as flavors, give them a shot.